Erik Friedlander has released over 20 CD's as a leader and has composed music for ads, dance works, documentaries and films. His most recent work includes the feature films Oh Lucy! (2017), directed by Atsuko Hirayanagi and Thoroughbreds (2018), directed by Cory Finley. Other films scored by Friedlander include the documentary Nothing On Earth, directed by Mick Angus, the feature film Future Weather by Jenny Deller, and the short film Spade by Mandi Riggi. If you're interested in talking about a film, use my "contact" page. It was a pleasure working with Matt Weiner and The Romanoffs team, including producer Blake McCormick and editor Chris Figler on the episode “End of The Line”. The score features the tsymbaly (Ukrainian cimbalom), some soulful melodies on the cello and bass clarinet, orchestral percussion and sparse electronics. Premieres November 16, 2018 on Amazon Prime. Recent spot for NBC/Universal. A fun one directed by Ryan Sage. Setsuko is stagnating in middle age until an English class (and a blonde wig) transforms her into a new persona named Lucy. Setsuko quickly falls for her instructor, John, but when he suddenly disappears, she recruits her sister and tracks him from Tokyo to the outskirts of Southern California. In an unfamiliar world of tattoo parlors and seedy motels, family ties and past lives are tested as Setsuko struggles to preserve the dream of Lucy. Oh Lucy premiered during the International Critic's Week at the 2017 Cannes Film Festival. Two teenage girls in suburban Connecticut rekindle their unlikely friendship after years of growing apart. In the process they learn that neither is what she seems to be -- and that a murder might solve both of their problems. Cast: Olivia Cooke, Anya Taylor-Joy, Anton Yelchin, Paul Sparks, Francie Swift, Kaili Vernoff. You can watch the trailer here. "Nothing On Earth" is a film by Mick Angus about photographer Murray Fredericks. Fredericks is an award-winning artist renowned for his photographs of the vast empty space of Lake Eyre, South Australia. When he relocates his work to the Greenland Icecap - atop a melting glacier and under the solar storms of the Aurora Borealis - he finds himself alone in a landscape he's never been, in a place he doesn't understand, hoping this time he hasn't taken his quest too far. What begins as an artistic odyssey becomes an adventure of extremes in one of the most breathtaking environments on Earth. Feature film directed by Jenny Deller. 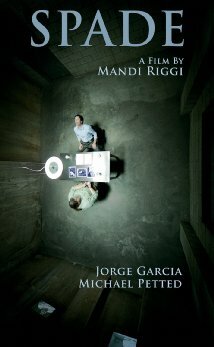 Short film by Mandi Riggi starring Jorge Garcia. A murder investigation has landed Alfred in an interrogation room, where to the surprise of a probing detective, he confesses to seven murders claiming the crown of "serial killer." The detective must determine if Alfred is bluffing, telling the truth, or simply insane. Spade is a study of self-absorbed alienation, exposing the psyche of a man obsessed with death and the absurdity of life.